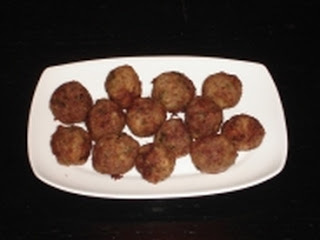 The classic Greek meatballs are called Keftedes and Keftedakia are a smaller version of them (akia at the end of a word in Greek means "small" in the plural). They can be eaten as a snack, as a meze with ouzo and/or beer or just as part of a buffet meal. Children love these! And they are easy and quick to prepare! Roll the mixture into small balls approx. the size of large walnuts. I'm from the Philippines, and there are Greek restaurants here too. But I've never seen these recipes before, they look so appetizing and delicious too! One question i have which you have not disclosed is...How many does each dish serve? There are only four of us now in the household and I wouldn't want anything left uneaten. Can you please indicate what the serving numbers are? Thanks. I love to cook and to eat too! :-)--Durano, done! Durano - Thanks for your comment! I've now added information in the blog introduction regarding no. of servings. They are for 4 -6, but we never waste anything as whatever is left over we eat the following day - and it's still tasty! Hi, thank u for replying my entrecard drop. i have blogroll your site in my serious droppers list. I visit all the sites in this list almost everyday plus most of my visitors too. We all have the same idea of getting return drop cards. Hope that you can blogroll my site back in your web too. McHughsrus - We're so glad to hear that! We've always found that kids (large and small!) love these and you can never make enough of them. Hope you enjoy them over Christmas and that you have a very, very happy Christmas and New Year! Anyone know how many this serves? It serves 4 - 6 people. Almost all Greek food retains it's good quality rewarmed the next day. Can these be oven cooked or pan fried?